Blessed are those who hear the words of this prophecy and keep what is written in it, because the time is near!" (Revelation 1:3, HCSB). Second, I began searching online for others who were discussing signs in the heavens. I landed on Scott Clarke's YouTube channel, eternalrhythymflow, where I literally gasped upon discovering there was a literal sign in the sky that seamlessly aligned with the prophetic vision in Revelation 12. The more that I watched Scott's videos, the more relieved I became after realizing that he was, not only Pre-Trib in his teaching, but also aware of crucial distinctions between YHWH's plan for the Church versus that of the nation Israel (props to you, brother, it is no accident you have been given an online platform to interpret the sign correctly for all who are diligent students of the Word). Further still, I was overjoyed to see that someone had supplied Scott with a link to Dr. Mike Svigel's discussion concerning the Rapture of the Church in the context of Revelation 12 (see his series called "Prophecy Autopsy"). Around the same time, I had also caught on to Dr. Svigel's writings on the topic. I share sentiments along with Greg L. that any further study of the Rapture of the Church in Revelation 12 owes a debt of gratitude to the stellar work of a Dallas Seminary prof who dug up a jewel that had been buried and long forgotten. Keep asking, and it will be given to you. Keep searching, and you will find. Keep knocking, and the door will be opened to you" (Matthew 7:7, HCSB). 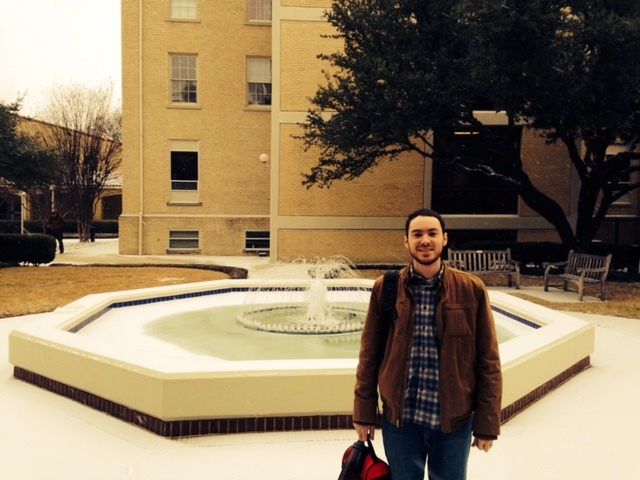 Here I am on campus at DTS, Feb. 2014; the fountain froze over! Dr. Svigel has two important works on the subject of Revelation 12, both published in the Trinity Journal: First, an article entitled The Apocalypse of John and the Rapture of the Church: A Reevaluation (2001) examines popular passages in Revelation that are possible candidates to the 1 Thess. 4:16-17 event; however, he demonstrates why Rev. 12:5 is the strongest argument despite being dismissed and neglected by most scholars. You can find this article online here. Second, and more recently (2014), he has published an article aptly titled "What Child is This? ": Darby's Early Exegetical Argument for the Pretribulation Rapture of the Church. This is the article that I found posted on a bulletin board at school, but to my knowledge, I'm not aware of it being available online. In this fascinating study, Svigel sifts through the letters of men like John N. Darby, Harry Ironside, and William Kelly (circa late 1800s) and reveals that these prominent dispensational teachers used Rev. 12:5 as their foundational text in defense of the Pre-trib Rapture of the Church. Somehow, someway, this vital passage got left out of modern, dispensational works such as the Scofield Reference Bible, Tim LaHaye's books, and many others who taught Pre-tribulationism. As a result a once popular and sound doctrine has fallen on hard times, giving way to Mid-Trib, Pre-wrath, and Post-Trib theories, plus a whole host of other bizarre and blurry interpretations. Anyone willing to venture that the timing of Dr. Svigel's discovery was an accident, or mere happenstance? Is it blind chance that his contributions have shed tremendous light on a GREAT SIGN whose fulfillment occurs in the Fall of 2017? Bah! If you're still tracking with me, please keep reading. I have discovered yet another hidden gem within this passage that has become oh-so-relevant for our time. The twelfth chapter of Revelation is central to the book as a whole; being right at the midpoint, it is the fulcrum, the hinge in the narrative, and yet it remains comprehensive in scope. I will even go a step beyond—it is the culminating vision of all that the OT and NT prophets have been reporting on all along throughout Scripture. In other words, the Day of the LORD isn't just near anymore (Isa. 13:6; Joel. 1:15; Jm. 5:8; 1 Pet. 4:7)...it is here. *Gary has noted that Gen. 3:15-16 contains in seed form a prophetic template that would later sprout throughout the Bible to include passages referring to a woman going into labor in order to give birth, though not without immense struggle and suffering (see this and other OT/NT passages cited here). In Revelation 12, the prophetic metaphor is now in full-bloom, or better yet—it has come to full-term! Even though chapter 12 comes at the midpoint of the book, this does not necessarily indicate that the events described occur during the middle of the Tribulation period [if you have studied Revelation long enough, you'll soon discover that your chronological charts were not as airtight as you once thought]. In a later post I would love to delve into the timing of everything involved in this chapter, but for now I will focus on our soon-coming rescue and escape. Let the panoramic vision of Revelation 12 fill your mind for a minute. Think about the major players involved. Greg L. [linked above] has done a great job outlining the who's-who in this passage in order to prevent confusion. We must acknowledge the individual/corporate cast of characters if we have any hope of a sound interpretation. If you are desiring to teach others, click here to access Mike Svigel's PowerPoint presentation (slides #43 and 60 are perfect to print out and provide a visual for what you are seeking to explain; just make sure you cite your source if you are going to use them). Two escapes are mentioned in Revelation 12 in back-to-back verses; however, two very different hiding places are given for each of the two parties who are rescued and delivered. So, according to the prophetic word given to John in Revelation 12, the appearing of the "great sign" means trouble for Jacob. Interestingly, this chosen remnant of ethnic Israelites is promised rescue and escape, but not before harsh discipline from YHWH himself (Jer. 30:11); and they will be delivered out of their trouble (Jer. 30:7), but not removed from the earth (Rev. 12:6, 13-17). Now things get really interesting. Anyone with maturity, intelligence, and experience knows where babies come from...or do they? Well, you know, God is always game for confounding the wise [humanly speaking] and doing amazing, powerful acts of mercy in behalf of His people (1 Cor. 1:18-25). The birthday surprise in Rev. 12:5 is no exception. Let's take a closer look. The Church, the body of Christ (1 Cor. 12:12; Eph. 1:22-23), united in Him by one Spirit (1 Cor. 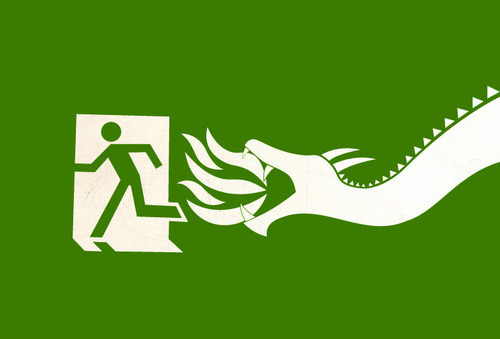 12:13), flees the dragon to a place prepared in a similar manner to Israel. Only in this instance, the body of Christ escapes to a different realm altogether—the woman's child (Gal. 3:16, 29; 4:6-7) is snatched up, seized, harpazoed [see the Greek]...taken outta here to God's throne in heaven (Rev. 12:5). Yes! I'm getting excited just thinking about it. This sudden birthing and catching away of the male child [corporately, the Church] will surprise many, even some of our own brothers and sisters in the Lord (1 Thess. 5:10). Ok. To recap: When the Day of the LORD arrives, both Israel and the Church will see an escape. However, Israel's escape is God's protective covering through their own tribulation on earth, while the Church's escape involves a complete removal of an entire mass of redeemed humanity from the earth. Both Israel and the Church have a place prepared for them at just the right time. Israel will escape and find refuge in the wilderness, where she will be given instructions by YHWH and wait for the Greater Moses to return, and from there He will lead them into the promised land. The Church, on the other hand, will be forcefully taken away from the earth, physically united with the Head of the body, and find their hiding place in the Father's house. We have a place; believing Israel has a place; and even the devil and his angels have a place (Matt. 25:41). In fact, the wicked sons of God are getting kicked out of the house soon...and we are moving into their former residence (Rev. 12:7-9). If you have made it this far, then you are probably like me and enjoy a deeper study of God's word. So now, a reward. I have chosen to provide my own translation of Rev. 12:5 above, because it is my firm conviction that the context warrants a certain minor, yet major, deviation from the norm. Most English translations consistently begin this verse with "And" or "She" in order to move the narrative along. However, since the Greek conjunction kai is flexible [it can be translated "and," "but," "even," or "also"], I feel strongly that the contrastive is necessary to bring out the full force of what is being revealed here. The dragon is seeking to devour the woman's child, and it almost looks like he is in prime position to do so (Rev. 12:4). But! Suddenly, the unexpected. The woman gives birth, yes, but this is not a normal labor and delivery process. Usually, a woman would experience joy when her baby is born (John 16:21), but in this particular case, there is no joy...only continued sorrow, pain, and increased labor (Rev. 12:6, 13-17). What's going on here? Well, now that we know that the Rapture, or "snatching up" of the Church, is coded into this text, the next question in my mind involves timing. Is there also a clue in the text as to the timing of this momentous event in relation to the rest of Jacob's trouble? Keep going, there's more. In his article The Apocalypse of John and the Rapture of the Church, Svigel highlights a key Greek term, arsen, that John specifically employs in order to direct readers back to an original source—Isaiah 66:7 in the LXX (Greek translation of the Hebrew Scriptures). In Greek there are three genders: masculine, feminine, and neuter. Rev. 12:5 reads, "But she gave birth to a son [masculine noun], a male child [arsen, a neuter adjective]..." Some have dismissed this as a grammatical error, but Svigel argues that this was intentional. And, boy, is it clever...you might even say, God-breathed (2 Tim. 3:16)! Before she goes into labor, she gives birth; before the pains come upon her, she delivers a son" (NIV). Almost every English translation that I've seen is unanimous in how they translate the Hebrew. I was reading this verse one day and it hit me...it's right there in plain sight, yet hidden from view. Look at it again, "Before she goes into labor, she gives birth; before the pains come upon her, she delivers a son [a male child]." The timing is there! John gives us the key to go back and look at this verse with the knowledge that we are going to be fully delivered, "birthed," but taken up suddenly to be with God in heaven [contra Israel, the woman, who remains below to go into labor and eventually see the birth of her other children (Isa. 66:8; Rev. 12:17; c.f. Mc. 5:3). Tell the Israelites: When a woman becomes pregnant and gives birth to a male child, she will be unclean seven days, as she is during the days of her menstrual impurity" (HSCB). Hmmm...intriguing isn't it? If you think I'm allegorizing or "spiritualizing" here, then take it up with Matthew and ask him what he did with Hosea 11:1 (see Matt. 2:15). It's evident to me that this seemingly obscure passage in the Torah is another prophetic template by which to understand the timing of events in Revelation 12. In this verse we have a woman giving birth to "a male child,"—and this is the same Hebrew word used in Isa. 66:7 [zachar]—and post-partum, you have the woman being unclean for "seven days," or one week. If you're tracking with me, then you have already jumped to Daniel 9:27, the most explicit OT reference for Israel's tribulation being one week, or 7 years in duration. Cheers, my friends. I pray that you have been blessed by this little gift. It's a hidden gem, so remember and hold on to it, 'cause we are on the eve of 2017. The great sign of Revelation 12 is on the horizon, and that means our rescue is that much closer. Extremely enlightening! Come Lord Jesus! My heart is racing. Oh *man* this is good! I was floored by the insight you shared about Isaiah 66:7. And yet it's been right there if front of our faces in black and white for so long. It's astonishing how you can read a verse a thousand times and one day you're suddenly struck by what it *actually says,* with a meaning so clear a fifth-grader could see it. As you brought out (and I'm glad you did), I too think that Scottie Clark's insight about the day of Pentecost being the *conception* vice the *birth* of the Church is a key point...no, you nailed it--a *paradigm shift* that warrants more widespread attention. Many things make *much* better sense with that mode of thinking. This concept clearly highlights the notion that the Church, rather than being "born" two thousand years ago, has in reality been more like a developing fetus for the last two millennia, and that it won't be "born" until the gestation is *complete*...or perhaps I should say "until the fullness of the Gentiles has come in," as in Romans 11:25. Paul makes it clear in that passage that it is after that point (i.e., the Rapture) that God will begin to "unharden" Israel, so to speak, and we're off to the prophetic races. This is really intriguing to me. Some of those obscure passages in the OT now make a lot more sense. I think you're on to something. Excellent writing and insight. Very surreal. Thank you for your encouraging comments, guys. I was glad to be able to put this together and share these insights with you all. I've got a question for you guys. I wrote an article a couple of years ago about the 24 elders, and one of the points I brought out in that article had to do with something I noticed in the throne room scene in Revelation 4 and 5. It's somewhat intriguing, but to date I have never heard anyone so much as mention it. In Revelation 5:6-7, we see the Lamb (Jesus) standing and taking the scroll from the Father. He is preparing to open the seals to initiate the Tribulation in chapter 6. He is essentially preparing to officially assume His kingly duties over the earth in the Millennial Kingdom, which He does in Revelation 11:15-17. What is Jesus *NOT* doing? Jesus is our High Priest (Heb. 6:20), and He sits at the right hand of the Father to intercede for us (Acts 22:69; Heb. 7:25). Why? Because there are still members of His body down here on earth stuck with a sin nature, still sinning to some degree. And Jesus has to continue with these priestly duties as long as we are on earth, right? But in the throne room scene in chapters 4 and 5, Jesus has clearly left off with those priestly duties, and is preparing to assume His kingly duties. Well, how can this be? Doesn't He need to continue interceding for us? How could Jesus simply quit interceding for His Church when we need Him the most? I trust you see where this is heading: In Revelation 5, Jesus is no longer performing His priestly duties for us. Why? Because He no longer needs to. Why? Because in Revelation 5, we're no longer sinful men on earth: we're perfected men in heaven. In the article I referred to, I mainly discuss the reasons why I am convinced the 24 elders do in fact represent the raptured Church; but this additional observation sure seems to go hand in hand with that. But I'm a little unnerved by the fact that I have *NEVER* heard anyone talk about this before, which makes me think I'm either stupid, crazy, or have missed something obvious that renders everything I just said null and void. That's why I am sharing this with you guys, because I am curious if you've ever thought about this before, and just want to know what you think. Because if this idea has merit and holds any water, it effectively ends the Rapture debate (well, not in reality, but you know what I mean). It nails it shut. If the Church are perfected men in heaven in Revelation 5, thus making it possible for Jesus to leave off with His priestly duties, thus allowing Him to get on with preparing for His kingly duties, we're all pre-tribbers because every other view is crushed out of existence. I don't think that's stupid at all - in fact I think you're really on to something. If you take a look at Acts 7:54-60 (the stoning of Stephen) you'll notice the same thing: Jesus is no longer sitting, but stands to receive Stephen's spirit. In other words it looks like when Jesus stands the intercession for a Believer is over. Mission complete. I'm on the same page, Greg. You covered it well in your article [very thoroughly, I might add]. Lol, I especially like the "all dressed up and nowhere to go" line. Sums up the post-trib/amillennial inconsistencies nicely. The book of Revelation is opening up more and more these days. Glad to be studying and watching with you, my friend. You know, one thought that occurred to me (although I don't enough about the Greek to really dig into it) is whether it's possible what Stephen saw was a vision of the future, when Jesus will stand in preparation to come in judgment. For example, it's like when when John says he "saw" Jesus open the seals. Well, Jesus didn't open the seals in AD 95. He was seeing a vision of the future. When Stephen says he "saw" Jesus standing, could it not be the same thing? I talk a little about this in the article...you don't need to plow through the whole shebang--just scroll down to the section entitled "First a Priest, then a King" near the end of the article. It's not long. I'm just interested in getting some opinions from others because I don't want to miss something or get too far off track. I'll take a look. It does make sense - after all God is outside of what we normally consider to be time. The Bible says that Jesus was the "lamb slain from the foundation of the world". It's almost like stepping into Narnia where time flows very differently. From Stephen and John's perspective they were actually seeing reality by glimpsing *through* a dimensional veil... at least that's my speculation. I did make it all the way to the end, and I did enjoy the article very much! I learned some new things about the Lords return which is always exciting! I've been following Scottie Clarke and the Revelation Sign for several years. I just wish more Christians would be as excited about his return as we are! The more we study the Sign, the stronger it becomes, and along with it, the timing of his return. We will never know with 100% certainty if this September will bring about the rapture of the church, but with everything that we do know at this moment, it's the most likely scenario. We now know that Jupiter, the King planet, in the Revelation 12 sign represents Christ and his church. Jupiter is a striped planet and the great red spot appears as a wound. In Isaiah 53:5 we read: ...He was wounded for our transgressions… and by his stripes we are healed. The next question is: how is the church represented in the sign? When we are raptured, we will go to the throne room of God, see Rev. 4. Surrounding the Throne are 4 living creatures. Also surrounding the throne are the 24 elders representing the church, and then all of the heavenly host, including a countless numbers of angels. Jupiter has at last count, 67 moons, the most in the solar system. It has 4 large moons, these were discovered by Galileo. The rest are all very small by comparison (all the rest added together make up .oo3% of the total orbiting mass.) The 4 moons represent the 4 living creatures, and all of the smaller moons represent the church and the heavenly hosts surrounding the Throne! I think we see the same thing in this sign. Nothing in it is by chance. The coming months are going to be very exciting as prophecy continues to be fulfilled almost by the hour now! Thank you, George. I'm glad you enjoyed the article. Thank you for sharing additional insights about the moons that orbit Jupiter...the thought never occurred to me to examine the moons and how they might relate to the heavenly throne room scene in Rev. 4. The upcoming months will be exciting to watch as we get closer to September. Big thumbs up. It is so clear. I will be sharing this. I appreciate it, Daniel. You have done good work and have a gift in the area of numbers and mathematics...something that I have sorely lacked throughout my education, lol (took me three times to pass pre-calculus). Just wanted to add, also isn't Satan not in in heaven after that too? Because he'd been thrown down to earth with his angels. I've dreamed of Jesus coming back for something long, and though I'm but a stay at home Mom, the Holy Spirit continues to show me these same passages. I was especially excited upon coming across the Isaiah 26 verses some years ago. So clear. Yet, to stand before the Lord of Glory so soon, and be accountable to our time with these last days- I feel like Noah preaching it and everyone, even Christians, rolling their eyes. God bless you guys for studying this. It's very encouraging. A special crown awaits those who long for His appearing! Amen. Thank you for your feedback and encouragement. To answer your question about Satan: Yes, after we are taken up to be with Jesus in the air (1 Thess. 4:16-17), the 'prince of the power of the air' (Eph. 2:2) no longer has a place there anymore (Rev. 12:7-9); basically, his time is up, and he won't have access to God's throne anymore. Which is cause for much rejoicing [for us], but dread and 'woe' for those on the earth (Rev. 12:10-12). Even though we may get eye rolls and blank stares, let's keep preaching like Noah (Matt. 24:37)! Thank you, sister. You are a vital member of the body of Christ. Well done on your research - this is exactly what I have been teaching in my church too! Because the sign relates to the heavens and the earth representation, I have been looking at the possible representations of the dragon. Some suggest a rogue planet (the planet x/9/7x theory). The earthly sign would be Satan's final empire - note that the crowns are on the heads, not the 10 horns (Rev 12:3 and Rev 13:1b). Rev 13 then shows the crowns on the 10 horns, so authority transfers to the horns in Rev 13. The dragon then makes war on the other offspring of the woman - these are the ones who obey the commandments and have the testimony of Yeshua/Jesus (Rev 12:17). These sound like the 144,000 who Satan then makes war with - I would be interested in your thoughts. You are right on with the authority transfer from the dragon given to the 10 horns; this is also paralleled in Rev. 17:12-14, where the 10 kings have yet to receive this authority, but once they do, it will be very brief (3 1/2 years of the Great Tribulation). Looking at our analytics, this article is getting shared quite a lot. Nice. Hi Jeff, this is an outstanding article! I downloaded and saved Dr. Svigel's powerpoint for future reference! Suffering is integral in being conformed to the image of Christ. The wilderness is a place of suffering that the body of Christ has passed through by the time Re 12:5 takes place, and they then are caught up to the throne of God. We are told not to harden our hearts as in the provocation in wilderness, He 3:15, for good reason. Forasmuch then as Christ hath suffered for us in the flesh, arm yourselves likewise with the same mind: for he that hath suffered in the flesh hath ceased from sin;  Beloved, think it not strange concerning the fiery trial which is to try you, as though some strange thing happened unto you:  But rejoice, inasmuch as ye are partakers of Christ's sufferings; that, when his glory shall be revealed, ye may be glad also with exceeding joy. Did you ever find a copy of Dr Svigel's article online? If not, I have a pdf I could send you. Let me know. Thank you. I've got copies of Svigel's articles, but I appreciate you asking. 1. Regarding the passage in Isaiah 66, there's another hidden gem in verse 12: "Behold I will extend peace to her like a river and the glory of the Gentiles like a flowing stream (Hebrew "nachal")..." In John 7:37, "In the last day [of the Feast of Tabernacles], Jesus stood and cried, saying, 'If any man thirst, let him come to me and drink. He that believeth on me, as the scripture hath said, out of his belly [innermost parts] shall flow rivers of living water.' (But this spake he of the Spirit, which they that believe on him should receive: for the Holy Ghost was not yet given, because that Jesus was not yet glorified." Out of our innermost parts shall flow rivers of living water. Those words speak of an abundant torrent of water. Next, Revelation 7:9-17 speaks of the saints who have come out of great tribulation. They are holding palms in their hand, indicating the Feast of Tabernacles, with white robes (Greek "stolas," not the white "himatiois" garments indicated in Revelation 3:5 and 4:4). Most importantly, the elder tells John in Revelation 7:17 that the Lamb will lead the tribulation saints to living fountains (Greek "peygas" meaning "spring" or "well," not John 7:38's "potamoi" meaning "river" or "flowing torrent"). There's even more, but this is another strong proof that the rapture is pre-tribulational and the church-age believers occupy a very special place in God's ultimate plan of redemption for both Israel and the Gentiles. 2. Regarding the earlier comment about Jesus being seated vs. standing at the right hand of the Father, a colleague of mine pointed me to Isaiah 2:10-21, particularly the word "arise" in verses 19 and 21, indicating the Lord will stand up to execute this judgment. I must admit, I struggle with some of what you have noted above Jeff, notably the alignment of Isaiah 66 with Revelation 12. In Isaiah 66, the birth of the child prior to labour pains is explicit, however in Revelation 12, the birth of the child after labour pains is explicit. So how are the two aligned? Firstly – verse 2 is clear that the woman “cried out in pain as she was about to give birth”. So it is clear here that 1) she is in labour pains, and 2) the baby hadn’t been born at the time of labour pains. There is nowhere else after the birth of the child in vs 5. 1) in vs 4, it is Satan himself (his ‘tail’ to be precise) who swept a third of the starts out of the sky (angels – fallen or not), whereas in vs 9, it was Michael and the angels who ‘hurled’ Satan and his angels to earth, not Satans tail..
2) In vs 6 – the woman is ‘taken care of for 1260 days’. This is unusual as the second half of the tribulation is where Israel is going to encounter the greatest amount of persecution…so why is it noted here that ‘that he is taken care of’. Taken care means to protect/preserve, however it is during this time that Israel suffers its greatest persecution, as do the tribulation saints. Matthew 24:15-21 makes it clear that upon seeing the abomination of desolation (mid-trib), Israel was to flee to the mountains, and that the following period would hold the greatest of tribulation, again seemingly opposing Gods care for the woman out of the reach of the serpent. 3) Vs 29 of Matthew 24 states “immediately after the distress of those days, the ‘stars will fall from the sky, and heavenly bodies shaken’ and then Jesus appears to gather his elect, but this event is seen by the whole world (cf harpazo). This is why pre/mid/post trib discussions remain difficult. Revelation 12 notes two ‘falling of stars’, again as noted above, that carried out by Satan himself, and that carried out by Michael and his angels. So to which ‘falling’ does Matthew 24 apply, or is it another falling of angels/shaking of heavenly bodies different to that of Revelation 12. 4) Luke 21: 25“There will be signs in the sun, moon and stars. On the earth, nations will be in anguish and perplexity at the roaring and tossing of the sea. 26People will faint from terror, apprehensive of what is coming on the world, for the heavenly bodies will be shaken. 27At that time they will see the Son of Man coming in a cloud with power and great glory. 28When these things begin to take place, stand up and lift up your heads, because your redemption is drawing near.” So who is Jesus speaking to hear? Tribulation saints, or believers pre-rapture?? Is this the rapture coming, or the return of Christ to earth??? Note the comment on the ‘shaking of heavenly bodies’. Again – is this the ‘casting down or hurling down of the stars’ noted in Revelation 12, and when it notes ‘when these things begin to take place, stand up and life up your heads’ – is this referring to ‘the signs in the sun, moon and stars’ (after which we are raptured), or would it include the shaking of the heavenly bodies and the falling of the stars from the sky as well (cf Revelation 12). If we hold to the rapture taking place after those things (signs in sun/moon/stars and shaking of stars/heavenly bodies), then does it not need to be considered that the rapture could take place after Revelation 12:4 (when Satans tail flings the stars to the earth (his fallen angels) and in alignment with Luke 21 and possibly Matthew 24 ‘shaking of heavenly bodies is the hurling down by God immediately after a mid-trib rapture). 5) Finally – why would Satan wait to devour the child if it is the church waiting to be raptured? At what point is the church ‘born’, and how on earth would Satan know what the ‘birth of the church’ looks like? He has been waring against the church for the last 2000 years…he is not ‘waiting’ for a single moment in time to quickly bring persecution against a church when he knows a church is not able to be born in a single moment. It doesn’t make sense…unless it is a dramatic event that could take place quickly…ie: the birth of the nation of Israel, or a dramatic revival of a particular nation that is going to give their lives to Christ in a single day (ie Israel). We know that this even is expected to take place mid-trib as a result of intense persecution (ie: “in his (Jacobs) affliction, he will call on me). - 23 September signs in the heaven – beginning of deep labour pains signifying start of the tribulation. Satan sweeps a third of the angels (his fallen angels) from heaven to prepare for the trib and to devour the male (Israelite believers) child the moment the national revival takes place mid-trib. - As soon as a significant revival takes place in Israel (and it could happen in a single day with the abomination of desolation), the rapture could well take place, with both gentile and jewish believers being raptured to heaven. - At that time, Satan and his angels war with Michael and Gods angels, and Satan and his angels are ‘hurled’ down to earth, where Satan knows his time is short (ie 3.5 years), and where the remaining Jewish people (who were possibly not part of the mid trib revival) are both violently persecuted by Satan, with the ‘remnant’ being protected in the wilderness by God. man of sin is even revealed. They will be left here to go through the Tribulation. Here is the main problem I see in the Pre Trib.If The Bride is the Church, and The Elect ones are The Jews.Who are at the White Room with palms in their hands?They are those who come out Of The great Trib.meaning The Bride is not the great multitude,because It never faced Tribulation. To me it is interesting to note:I really have my eye on next Sabbath, November 3, where the Torah reading from old is "The Day of His Appearing.". Yesterday I allowed myself to consider that the rapture may happen on a Sabbath. Till yesterday I was pretty adamant that the rapture, like the resurrection of Jesus, like Pentecost would occur on a Sunday the first day of the week. However, a resurrection/pentecost change on a first day of the week is like God saying. "OK its Sunday, the first day of the week, let's get to work". However, the rapture is not a kick in the pants to get to work, it is rest. I think now that reaching a Sabbath rest on a Sabbath would be a great idea. If so, reaching rest on the day of His appearing, “Vayera” one day before the Antifa rebellion of November 4, sounds like a pretty good idea to me. 746 days till Jupiter left Virgo, October 13, 2017 - Strongs #746 greek is "it is beginning or reference back to beginning" pointing perhaps back to the Great Sign or forward to rapture.